Lorna Irving first came to prominence when she won the 1984 Glasgow Marathon in what was then a course record of 2:37:19. She had started running after being inspired by watching Joyce Smith win the 1983 London Marathon and thought “I can do that!” Eighteen months later with only two attempts at the distance behind her, she shattered the Glasgow Marathon record in one of the fastest times recorded in Scotland. What was so remarkable about Lorna’s run was that it was only seven minutes slower than Joyce’s London time. Joyce had been running since a teenager, had reached the semi-final of the 1500 at the 1972 Olympic Games, had held the world record for the 3000, and won several medals in the world cross country championships. Lorna was not without a background in sport. She had been riding horses since a very young age and for a time had been a professional horsewoman. The strength she built up over these years coupled with her light frame gave her the ideal build for endurance running. 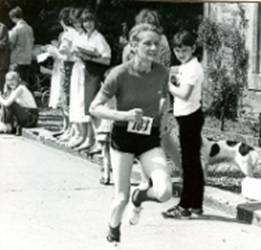 Her first race was the Muckle Toon Run in her home town of Langholm; her next race was her first marathon at Windermere in 1983 in 2:52:08, a time which still stands as the course record. She followed this up with a 2:44:00 in London the following year, then came her breakthrough in Glasgow. For the next few years she dominated road races in Scotland and the North of England. her half marathon personal best of 71:44 still stands as the UK W40 record and is fifth in the Scottish All Time lists. No one has yet come close to her course record of 56:59 for the 1986 Derwentwater 10. For a distance runner she had remarkable speed and recorded 9:25.2 for 3000 metres in a UKWAL match when running for Edinburgh Southern. Lorna was never known as a cross country runner and and only once contested the National Cross Country Championships, in 1987 which doubled as a trial for the Scottish team. This would be the final time Scotland would be able to compete as an individual nation in the World Cross Country Championships. Lorna finished ninth in the field, which because of it significance was much stronger than most other years and unfortunately she missed selection for the team. Lorna’s marathon pb of 2:36:34 came at the 1986 Commonwealth Games in Edinburgh finishing a creditable sixth in a marathon won by the Australian Lisa Martin. Although born in England she had been resident in Scotland most of her life so qualified to compete for Scotland. Her time in Edinburgh stands as the twelfth fastest of all time in the Scottish Women’s Marathon rankings. The last result we can find for Lorna was the Glasgow Half Marathon in 1988 where she was third in 73:26 behind Sheila Catford (72:49) and Sandra Branney (73:02) in what was probably the most competitive Women’s Half Marathon Race in Scotland. Lorna still lives in Langholm where she owns and trains racehorses.